Hyundai looks all determined to expand its i20 lineup; the reason behind the presumption is the latest unveil Hyundai i20 Active 2016. At the Frankfurt Motor Show 2015 company gained convincing eyeballs for this rugged looking newly designed efficient model. 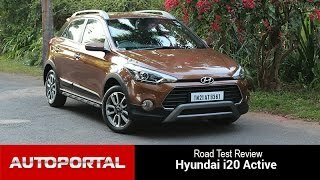 Let us have a look at the review of Hyundai i20 Active 2016 to know about it in detail. The interior of Hyundai i20 Active 2016 resembles to that of standard i20, however few modification can be very easily noticed. The list of enhancements include a longer center console portraying a cleaner look, a higher driving position for better view and metal pedals that give the interior a bit of rugged look, the one inspired from any crossover. Apart from this rest all matches with the standard model. Model offers lots of space for you and the cargo you carry and infact thanks to its longer wheelbase that it offers better legroom in comparison to the rest in this segment. While rounding up the interior details of Hyundai i20 Active 2016 I would like to mention that one thing which you might miss in comparison to the standard version and that’s the panoramic roof which isn’t available in the active version. 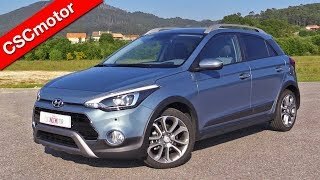 Though the exterior of Hyundai i20 Active 2016 carries a new design language but still you can very easily define it to be an i20. To an extent you can call this model as a skid plates and side cladding integrated hatchback. The model is also adorned with side skirts and wheel arch moldings that resemble to one present in crossover. A little closer view will unveil the redesigned parts like the bumpers that come integrated with fog lamps and a front grille with chrome frame finished in gloss-black. At the back also have a new rear spoiler which gives the model a sportier look. 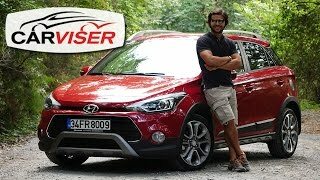 In all rounding up the exterior details of Hyundai i20 Active 2016 I would say, rolling over those massive 17” wheels and dipped in Morning Blue color model looks amazingly gorgeous. The Hyundai i20 Active 2016 hides two powertrain options beneath its hood. Both the engine are a 1.0 liter Kappa three-cylinder engines but the first one generating total output of 98 hp and peak torque of 171.6 nm while the second on cranking total output of 118 hp and peak torque of 171.6 nm paired to five-speed manual transmission. 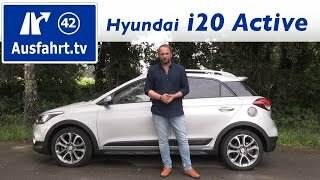 With this power rolling the model top speed of Hyundai i20 Active 2016 touches the mark of 109 mph and 114 mph respectively while the 0-62 mph sprint can be knocked in just 10.9 seconds and 10.3 seconds respectively.